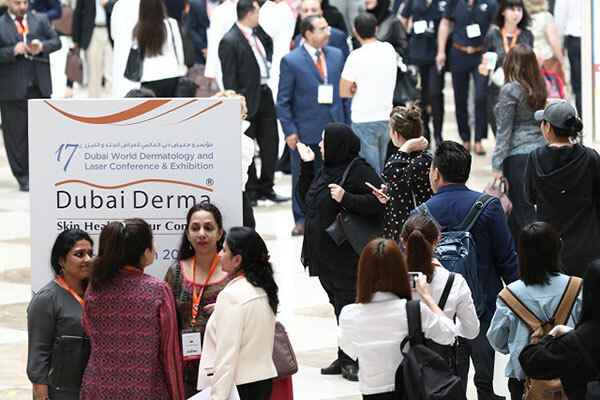 A total of 540 companies from 95 countries are participating in Dubai World Dermatology and Laser Conference and Exhibition (Dubai Derma) opening on Monday (March 19) in Dubai, UAE. The 18th edition of the event dedicated to dermatology, skin care and laser is expected to attract over 15,000 visitors at the Dubai International Convention & Exhibition Centre. The three-day conference and exhibition, occupying 11,500 sq m is set to play host to 265 expert speakers, specialists of skin health from the region and the world while also featuring 72 workshops, 164 scientific sessions and 70 poster presentations. In addition, delegates and participants attending the premier global skin conference will have the opportunity to gain 18 CME Credit Hours from the UAE University. “Dubai Derma will bring together eminent speakers from the region and around the globe covering a wide spectrum of themes affecting the world of dermatology. The Dubai Derma scientific program features a four-day pre-conference course, conference program, workshops and live demonstrations exemplifying novel cosmetic and dermatological procedures. “In addition, the American Academy of Dermatology - AAD will have their own first session internationally and Dubai Derma fully appreciates the upmost support and collaboration with AAD. Dubai Derma provides all dermatology colleagues worldwide with a vibrant platform to update their knowledge, explore new advances in the dermatological and technological field, and foster closer ties,” he added. "The members and council of the Asian Dermatological Association are looking forward to participating in this 18th Dubai Derma 2018 Conference which is in collaboration with our very own 11th Asian Dermatological Congress (ADC). The last time the ADC was held in Dubai was 26 years ago. This joint event promises to be a world-class educational and multi-cultural highlight of our International Dermatologic Community. I invite all friends and colleagues to be a part of this most anticipated event of the year," said Dr Steven Chow, president of the Asian Dermatological Association. Dubai Derma, this year, will dedicate two full days for Case Report Presentation and Competition, in order to encourage dermatology researches in the region and abroad, wherein dermatologists and resident doctors from different countries will be present to showcase their case reports. Moreover, a poster presentation competition will offer a unique opportunity for researchers in the UAE and abroad to present their work and illustrate their research methods and outcomes. Running parallel to the conference, Dubai Derma Exhibition aims to provide an ideal opportunity for exhibiting companies to network, partner and expand their businesses in the Skin Care, Aesthetic and Laser market among many other such fields. Furthermore, the exhibition will play host to a number of product launches and live demonstration of latest skincare solutions while also offering a highly interactive environment for visitors to experience the latest products and services in the skincare industry.